Rally on Capitol Hill to demonstrate their commitment to lung health. 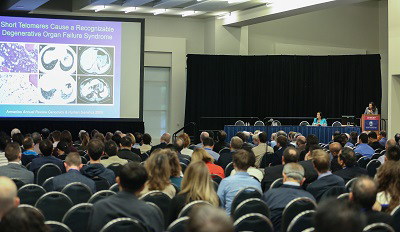 Participate in sessions geared toward topics and issues in pulmonary and critical care medicine. Learn about the latest research and scientific findings. Raise funds to support research grants for young investigators. Explore the latest technology and innovation in the Exhibit Hall. Connect with and learn from prominent clinicians and scientists. Celebrate the centenary of the American Journal of Respiratory and Critical Care Medicine. 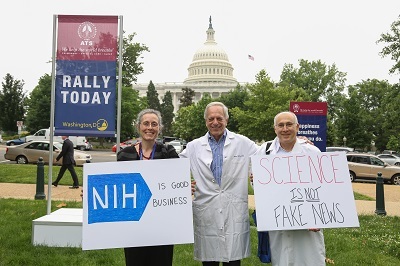 Approximately 500 ATS 2017 attendees came together for the ATS Rally on Capitol Hill: Lab Coats for Lungs. The purpose of the event was to call attention to policies that jeopardize patient health, research, and the environment. U.S. Senators Edward Markey (D-MA), a tireless advocate for clean air policy, and Tom Carper (D-DE) were also in attendance and addressed the crowd, which included pulmonary clinicians and researchers, as well as patient advocates. 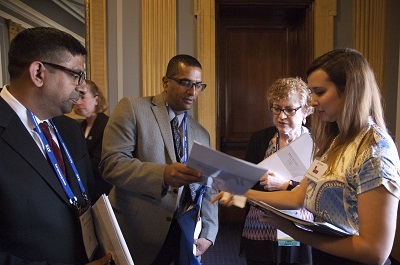 Attendees also participated in the Hill Day that took place during the conference. 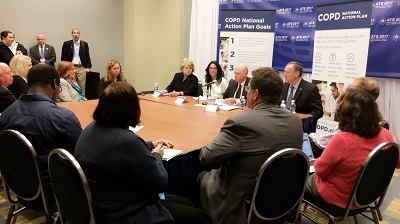 Physicians, researchers, and patients met with their Congressional Delegation to weigh in on various initiatives, from funding federal agencies to matters relating to lung health research and pulmonary, critical care and sleep research. See the complete list of the Best of the ATS Conference. Go to the ATS Store. Click on the Account link at the top right of the page. Enter your conference badge number and last name. Click on the Free Conference Sessions tab. Check out all of the research highlights from ATS 2017. Attendees gathered for the Ninth Annual ATS Foundation Research Program Benefit at the Marriott Marquis Washington, DC. The event raised more than $425,000 from corporate, medical institution, and individual supporters; proceeds will support research grants for young investigators who strive to become independent researchers. 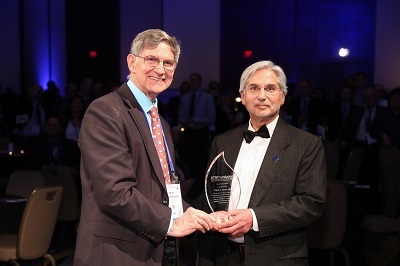 The benefit also honored David M. Center, MD, with the 2017 Breathing for Life Award for his service as a clinician, investigator and teacher. This award is the highest honor given to an ATS member for philanthropy, scientific achievement, and commitment to mentorship. Mark your calendars! The 10th Annual ATS Foundation Research Program Benefit will take place on Saturday, May 19, 2018, at 7 p.m. at the Manchester Grand Hyatt. 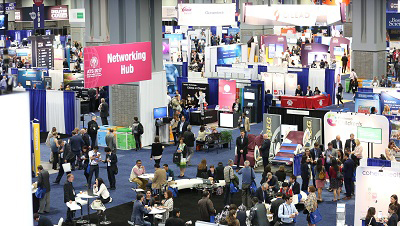 The ATS International Conference Exhibit Hall, a Certified Exhibition by the International Association of Exhibitions and Events, was home to the latest technology developments and clinical trial experiences and products. More than 200 exhibitors were on-site to offer attendees a hands-on opportunity to explore new technologies, services, and innovative products. At select Guru Bars, Industry Theaters, and NIH Theater sessions, investigators learned about progress in learning and technology from exhibitors currently involved in trials. 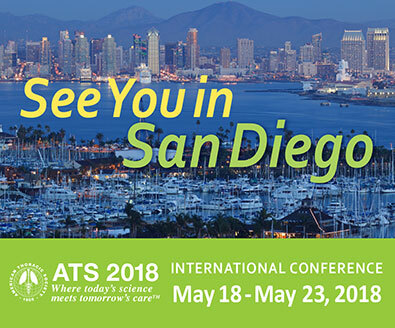 The ATS Keynote Series featured presentations from world-renowned clinicians and scientists, highlighted state-of-the-art lectures, and showcased major discoveries in pulmonary, critical care, and sleep medicine. Topics ranged from pathogenesis and management of drug-resistant TB, lung cancer trials in the age of precision medicine, and a geological perspective of climate change and global warming, to hypoxia-inducible factors in physiology and medicine, efforts to reduce infections and evaluate safety efforts, and cystic fibrosis lung disease. 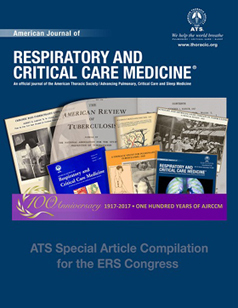 This year, the American Journal of Respiratory and Critical Care Medicine is celebrating its centenary. In a session dedicated to the history and impact of the AJRCCM, the editors shared the most important papers from the Journal that helped change practice. 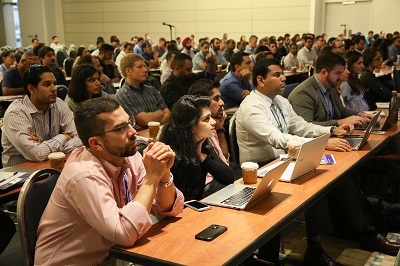 The session reflected on the goals of AJRCCM by emphasizing the importance of research, as well as pausing to celebrate a century of advances in medical science and how those developments are shared and reflected in improvements in publishing. In his keynote lecture Jeffrey Drazen, MD, editor-in-chief of the New England Journal of Medicine, explored developments in medical publishing and how they enhance the publishing field. This session was supported by an educational grant from AstraZeneca LP, GlaxoSmithKline, Mylan, Inc., Teva Pharmaceuticals, and Vertex Pharmaceuticals, Inc. Learn more about the history of the AJRCCM and its importance to the progress of respiratory, sleep and critical care medicine.